“A Scene in the Court of Chancery”, by John Doyle (1829), depicting William and Helena Long-Wellesley. Image © National Portrait Gallery, London. 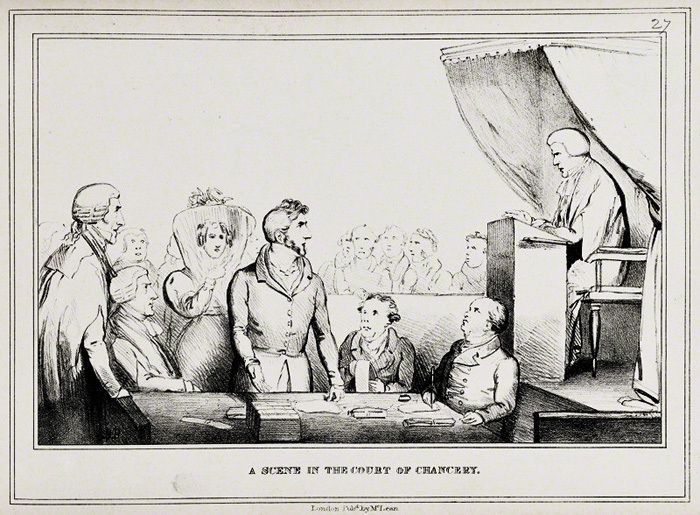 "A Scene in the Court of Chancery", by John Doyle from "Political Sketches by H.B." Volume I, published by Thomas McLean, lithograph, 1829. 11 1/4 in. x 16 1/4 in. (286 mm x 412 mm) overall. Acquired Unknown source, 1900. Reference Collection NPG D40962. Persons depicted include William Pole-Tylney-Long-Wellesley, later 4th Earl of Mornington (1788-1857) and Helena (née Paterson, late Bligh), later Countess of Mornington (died 1869).